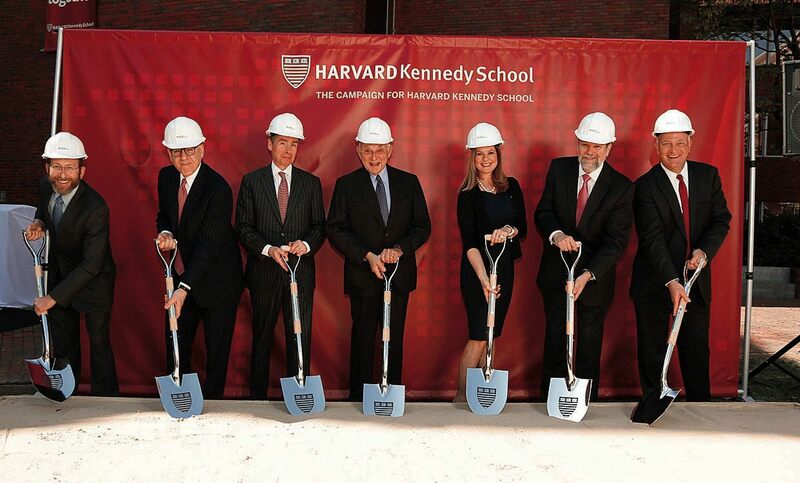 This was the roster on May 7 as the Harvard Kennedy School ceremonially broke ground on its campus renovation and expansion (shown above, left to right): Alan M. Garber, provost; David M. Rubenstein, chair of the school’s capital campaign and co-CEO of The Carlyle Group (a private-equity firm); Graham S. Wyatt, lead architect (partner, Robert A.M. Stern Architects); lead donors Leslie H. and Abigail S. Wexner (he founded and is CEO of L Brands, formerly The Limited, retailers); David T. Ellwood, dean; and John Haigh, executive dean. The real dirt is now flying, as the school builds in and around its courtyard (the level of which will be raised), as described at harvardmag.com/hks-15 ; Ellwood, who stepped down effective June 30, will be mercifully spared colleagues’ complaints about construction annoyances. The Faculty of Arts and Sciences on April 7 approved the new undergraduate concentration in theater, dance, and media (see harvardmag.com/theater-15 ); its vote was pending when the May-June issue went to press (and where “media” was erroneously rendered as “music” in Brevia ). During the same meeting, the faculty also approved the new College honor code and associated changes in procedures for hearing cases of alleged academic misconduct (see University News Briefs , May-June). The Cambridge Historical Commission has approved Harvard’s plans for restoration and renovation of 1350 Massachusetts Avenue (the former Holyoke Center, designed by Josep Lluís Sert, former dean of the Graduate School of Design) into the Smith Campus Center. This is one of the important regulatory clearances required before construction can proceed next year, given the plans for features such as a reconceived plaza facing Harvard Square, and other lower-level spaces for public and University community use.…In New Haven, Yale announced a $150-million gift from its alumnus Stephen A. Schwarzman to renovate the freshman dining Commons and the associated Memorial Hall, remaking them into a campus center with social and performance spaces, galleries, offices for student organizations, and technology to enable worldwide connectivity. Schwarzman, also a 1972 Harvard M.B.A., founded and runs the Blackstone asset-management firm. The gift includes $20 million, to be matched by Yale, for programming, staff, and operations during the center’s first decade; it is scheduled to open in 2020. The University has launched onecampus.harvard.edu, a website that pulls together videos, articles, and other information on the major institutional building objectives of The Harvard Campaign: Allston, and particularly the new School of Engineering and Applied Sciences facility; undergraduate House renewal; and the Smith Campus Center. In the meantime, leasing is under way for the Continuum apartments rising at the corner of North Harvard Street and Western Avenue, beyond the Stadium and the Business School campus. A partner is developing the project on land leased from Harvard; units are offered at full local market rates, beginning at $2,380 for studios and $2,700 for one-bedrooms, and scaling up to $4,995 and up for three-bedroom rentals. The University’s annual tax filing, released in mid May, shows that for calendar year 2013 (the data are reported with a lag), Jane L. Mendillo, then president and CEO of Harvard Management Company (HMC), earned $9.6 million, double her 2012 compensation. Stephen Blyth, who then managed the endowment’s public-market assets, earned $11.5 million; he succeeded Mendillo at the beginning of 2015. During Harvard’s fiscal year ended June 30, 2014, President Drew Faust earned $785,000—and total compensation of slightly more than $1.1 million, including retirement and deferred benefits and the nontaxable value of living at the president’s residence, Elmwood. (She also earned $250,000 in director’s fees from Staples, Inc.) More details on HMC’s top earners, and the pay for Harvard’s top administrators, appear at harvardmag.com/pays-15 . Months after Steve Ballmer ’77 bolstered the School of Engineering and Applied Sciences with a campaign gift for a dozen new computer-sciences faculty positions (see harvardmag.com/ballmer-15 ), Yale’s smaller department received funding to add seven new professorships in the next few years, as a “foundation for further potential growth.” The department will also formally join Yale’s School of Engineering & Applied Sciences, and be connected to it via 10,000 square feet of new engineering laboratories.…Separately, Yale’s Center for Teaching and Learning sponsored an initial “Faculty Bulldog Days,” during which more than 100 professors opened their classes to colleagues, and more than 250 faculty members sat in on fellow teachers’ courses, gaining exposure to different disciplines and teaching methods.…And the University of California, San Diego received a $100-million pledge from the Rady Family Foundation to support the Rady School of Management; Evelyn and Ernest Rady and their foundation made an initial $30-million gift to establish the school in 2004. Alongside their fundraising responsibilities, today’s university leaders regularly remind lawmakers in Washington, D.C., of the importance of funding basic research. (President Drew Faust distilled this message in her View from Mass Hall column,  May-June 2014.) The general case was made specific, and with special force, in MIT’s April report, “The Future Postponed: Why Declining Investment in Basic Research Threatens a U.S. Innovation Deficit,” drawn up by 30 professors and other academic leaders. It cites four major scientific advances of 2014—none originating in the United States—and then makes the case for renewed investment in fields ranging from Alzheimer’s disease (a financial stepchild, compared to cancer funding) to cybersecurity, infectious disease, and fusion energy. These days, it seems, it is venture capital Uber alles, giving the entire economy a Lyft. But VC had to be invented, too. George F. Doriot: Educating Leaders, Building Companies , at Harvard Business School’s Baker Library, focuses on a master professor who was also for many years president of American Research and Development Corporation, the first publicly funded VC firm and one of the first modern VC enterprises. Early annual report covers, from the exhibition, are shown here. Notable Norton lecturer. Novelist Toni Morrison—Nobel laureate, Pulitzer Prize winner, Presidential Medal of Freedom winner, and Harvard honorand (Litt.D. ’89)—is scheduled to deliver the 2016 Norton Lectures next March and April. Her talks, on “Baring Witness, Bearing Views,” will take place in Sanders Theatre, beginning on March 2. She read from the manuscript of her novel-in-progress, A Mercy, during President Drew Faust’s installation service in 2007, and was Harvard Divinity School’s Ingersoll Lecturer (also in Sanders) in 2012 (see harvardmag.com/morrison-15 ). Acting dean. During Commencement week, President Drew Faust announced that Ford Foundation professor of democracy and citizenship Archon Fung will become acting dean of the Harvard Kennedy School on July 1. Dean David T. Ellwood announced last fall that he would step down at the end of this academic year. Fung is the school’s academic dean. Update: On June 11, after the magazine went to press, Douglas W. Elmendorf was appointed dean of the Kennedy School, effective in January . Medical merits. Korsmeyer professor of cell biology and medicine Bruce M. Spiegelman has been awarded the 2015 Health Prize, Belgium’s highest scientific honor, for work on the mechanisms of metabolic disorder; it comes with a $270,000 honorarium.…Separately, Mallinckrodt professor of chemistry and chemical biology Xiaoliang Sunney Xie is co-winner of the Albany Medical Center Prize in Medicine and Biomedical Research, for work on probing the activity of single molecules in living cells. He shared the $500,000 prize with Karl Deisseroth ’92, a professor at Stanford. Lowell House on deck. With the reconstruction of Dunster House expected to conclude in late summer, and Winthrop slated to undergo complete renovation and expansion beginning in June 2016, the College has announced the next House to be renewed: Lowell will be vacated for makeover beginning in June 2017. Details appear at harvardmag.com/Lowell-15 . Mideast scholars at peace. Among the deceased professors recalled in Memorial Minutes read during Faculty of Arts and Sciences meetings this year, perhaps no duo echoed more resonantly than those honored on May 5: the late Frank Moore Cross, Hancock professor of Hebrew and other Oriental languages, a scholar of the Hebrew Bible and the Dead Sea Scrolls; and the late Wolfhart Peter Heinrichs, Jewett professor of Arabic, a pioneering Arabic philologist and leader in Islamic studies. Miscellany. Harvard College reported an admissions yield (those who accepted offers of admission to the class of 2019) of 81 percent, consistent with recent years.…Zachary R. Mider ’01 won the Pulitzer Prize for explanatory reporting for a Bloomberg News series on corporate tax avoidance. Other alumni and faculty who were nominated finalists are detailed in harvardmag.com/mider-15 .…Harvard Business School Publishing, housed of late at the Arsenal on the Charles (a Watertown complex acquired by Harvard in 2001 and sold in late 2012) is moving farther west, to the Brighton headquarters complex of New Balance, the shoe company. HBSP is expanding by 35,000 square feet.…Claudine Gay, professor of government and of African and African American studies, has been appointed dean of social science within the Faculty of Arts and Sciences; she succeeds Peter Marsden, Geisinger professor of sociology, following a five-year term.…Edouard Kopp has been appointed Abrams associate curator of drawings; he had been at the J. Paul Getty Museum (see harvardmag.com/kopp-15 ).…The Bureau of Study Counsel, which provides undergraduates with academic and learning support, will come under the auspices of Harvard College on July 1. It has been part of Harvard University Health Services, which provides mental-health-related counseling.